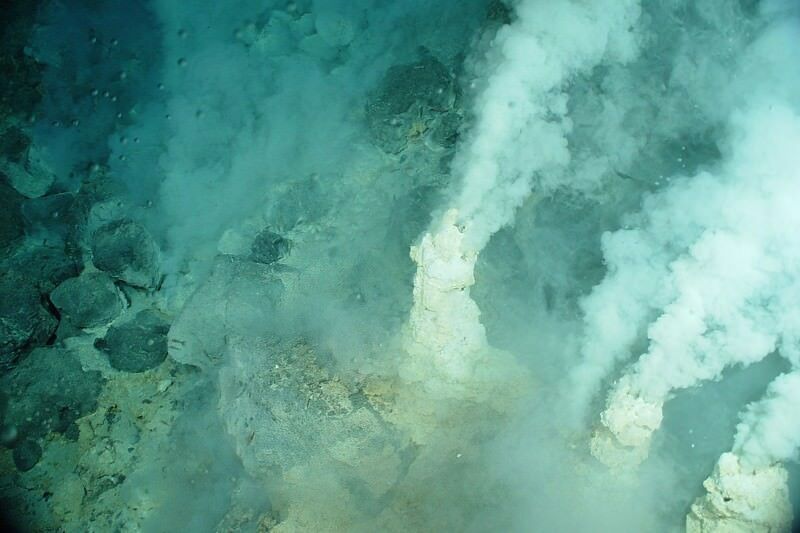 NASA scientists studying the origin of life have reproduced uracil, cytosine, and thymine, three key components of our hereditary material, in the laboratory. They discovered that an ice sample containing pyrimidine exposed to ultraviolet radiation under space-like conditions produces these essential ingredients of life. Pyrimidine is a ring-shaped molecule made up of carbon and nitrogen and is the central structure for uracil, cytosine, and thymine, which are all three part of a genetic code found in ribonucleic (RNA) and deoxyribonucleic acids (DNA). RNA and DNA are central to protein synthesis, but also have many other roles. An ice sample is deposited on a cold (approximately –440 degrees Fahrenheit) substrate in a chamber, where it is irradiated with high-energy ultraviolet (UV) photons from a hydrogen lamp. The bombarding photons break chemical bonds in the ices and break down the ice’s molecules into fragments that then recombine to form new compounds, such as uracil, cytosine, and thymine. NASA Ames scientists have been simulating the environments found in interstellar space and the outer Solar System for years. During this time, they have studied a class of carbon-rich compounds, called polycyclic aromatic hydrocarbons (PAHs), that have been identified in meteorites, and which are the most common carbon-rich compound observed in the universe. PAHs typically are structures based on several six-carbon rings that resemble fused hexagons, or a piece of chicken wire. The molecule pyrimidine is found in meteorites, although scientists still do not know its origin. It may be similar to the carbon-rich PAHs, in that it may be produced in the final outbursts of dying, giant red stars, or formed in dense clouds of interstellar gas and dust. In theory, the researchers thought that if molecules of pyrimidine could survive long enough to migrate into interstellar dust clouds, they might be able to shield themselves from destructive radiation. Once in the clouds, most molecules freeze onto dust grains (much like moisture in your breath condenses on a cold window during winter). These clouds are dense enough to screen out much of the surrounding outside radiation of space, thereby providing some protection to the molecules inside the clouds. Scientists tested their hypotheses in the Ames Astrochemistry Laboratory. During their experiment, they exposed the ice sample containing pyrimidine to ultraviolet radiation under space-like conditions, including a very high vacuum, extremely low temperatures (approximately –440 degrees Fahrenheit), and harsh radiation. They found that when pyrimidine is frozen in ice mostly consisting of water, but also ammonia, methanol, or methane, it is much less vulnerable to destruction by radiation than it would be if it were in the gas phase in open space. Instead of being destroyed, many of the molecules took on new forms, such as the RNA/DNA components uracil, cytosine, and thymine, which are found in the genetic make-up of all living organisms on Earth. “We are trying to address the mechanisms in space that are forming these molecules. Considering what we produced in the laboratory, the chemistry of ice exposed to ultraviolet radiation may be an important linking step between what goes on in space and what fell to Earth early in its development,” said Christopher Materese, another researcher at NASA Ames who has been working on these experiments. “Nobody really understands how life got started on Earth. Our experiments suggest that once the Earth formed, many of the building blocks of life were likely present from the beginning. Since we are simulating universal astrophysical conditions, the same is likely wherever planets are formed,” says Sandford. Additional team members who helped perform some of the research are Jason Dworkin, Jamie Elsila, and Stefanie Milam, three NASA scientists at NASA’s Goddard Space Flight Center in Greenbelt, Maryland. The research was funded by the NASA Astrobiology Institute (NAI) and the NASA Origins of Solar Systems Program. The NAI is a virtual, distributed organization of competitively-selected teams that integrates and funds astrobiology research and training programs in concert with the national and international science communities.